Every Labor Day Weekend for the 11 years GCHR (GeoCaching Hampton Roads) has held their Annual Picnic. Last year (2012), the event became a MEGA-event making the picnic Virginia's first ever Mega-event. This year, 2013, GCHR once again is planning another great event, hopefully, to meet and exceed last year's totals of fun, excitement and attendance. Vendors are returning again, and new vendors are planning on attending. The staff and volunteers of GCHR are deep into planning and if the planning meeting that I attended yesterday is any indication - fun will be had by all!!! I have been compiling lists of top caches in the area for the event. So as an intro into The Hampton Roads area - here is some information that may assist you if you are planning on coming to the area for the picnic. 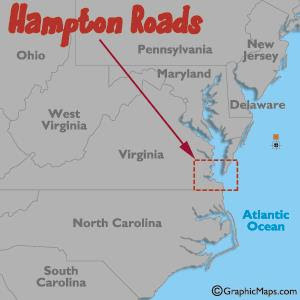 Hampton Roads is the name for both a body of water and the Virginia Beach-Norfolk-Newport News, VA-NC metropolitan area which surrounds it in southeastern Virginia. Hampton Roads is notable for its large military presence and its year-round ice-free harbor, and hundreds of miles of waterfront property and beaches, all of which contribute to the diversity and stability of the region's economy. The water area known as Hampton Roads is one of the world's largest natural harbors, and incorporates the mouths of the Elizabeth River and James River with several smaller rivers and itself empties into the Chesapeake Bay near its mouth leading to the Atlantic Ocean. The land area includes dozens of cities, counties and towns on the Virginia Peninsula and in South Hampton Roads. 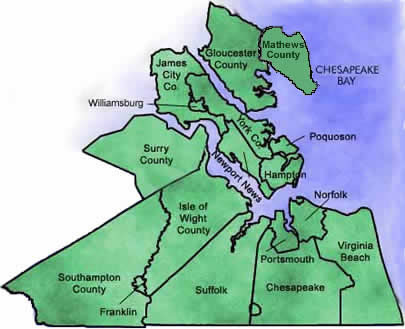 Some of the more outlying areas from the harbor may or may not be included as part of "Hampton Roads", depending upon the organization or purpose. For a commonly used example, as defined for federal economic purposes, the Hampton Roads metropolitan statistical area (MSA) additionally includes two counties in northeastern North Carolina and two counties in Virginia’s Middle Peninsula. Officially, the Virginia Beach-Norfolk-Newport News, VA-NC MSA has a population of about 1.7 million, the 36th-largest metropolitan area in the United States. The area is steeped in 400 years of American history and hundreds of historical sites and attractions in the area draw visitors from around the world each year. The harbor was the key to the Hampton Roads area's growth, both on land and in water-related activities and events. The harbor and its tributary waterways were (and still are) both important transportation conduits and obstacles to other land-based commerce and travel. Creating and maintaining adequate infrastructure has long been a major challenge. The Hampton Roads Bridge-Tunnel (HRBT) and the Monitor-Merrimac Memorial Bridge-Tunnel (MMMBT) are major harbor crossings of the Hampton Roads Beltway which links each of the largest population centers of Hampton Roads. In 2007, the new Hampton Roads Transportation Authority (HRTA) was formed under a controversial state law to levy various additional taxes to generate funding for major regional transportation projects, including a long-sought and costly third crossing of the harbor of Hampton Roads.